Sometime on Saturday, Steve Ackerman sold his last joint. His Organic Alternatives, a medical marijuana dispensary in Fort Collins, is one of 23 in this laid-back university town forced to close by Tuesday after residents voted to ban dispensaries. I wont continue in the medical marijuana industry, said Ackerman, who opened his comfortable saloon-like dispensary two years ago. But I will continue to support it, and Ill continue to help fight for what I think is right. Marijuana should not be prohibited. Cruise south a little less than 150 miles and youll find the opposite scenario, one of Colorados medical marijuana capitals in a city known as a conservative stronghold. Number of churches 200 churches within Colorado Springs city limits, based on property tax exemptions granted for religious purposes and excluding related church property such as parking lots. Number of medical marijuana businesses 235 licenses issued by the Colorado Springs city clerk for dispensaries, infused edible manufacturers and plant grow centers, for use at 176 unique locations. Neon green crosses signifying medical marijuana businesses now light up so many shops in Colorado Springs that they rival the number of churches in a town where evangelical Christians often dominate. Welcome to the new Tale of Two Cities, a real-life drama playing out as Coloradans wrestle with how to handle the resurgence in popularity of this ancient plant. Voters narrowly approved the use of marijuana for limited medicinal purposes in 2000. But it wasnt until 2009, when more than 700 medical marijuana dispensaries began sprouting in neighborhoods across the state, that the issue became kitchen-table conversation. Since then, more than 80 communities have banned dispensaries, outlawing them from Alamosa to Greeley. School leaders lament a 45 percent spike in drug offenses, an increase sparking a federal crackdown on dispensaries near campuses. Colorado has become a national focal point in the debate over efforts to legalize medical marijuana, as over a dozen states weigh legislation to approve its use and join the 16 states where those laws are already on the books. Fort Collins and Colorado Springs the college town that banned dispensaries and the conservative city that didnt illustrate how different communities grapple with the results. Later this month, Fort Collins will be the focus of a new TV series, American Weed, shot by a National Geographic crew that spent months filming the battle over the ban. Birds fly past a church steeple in conservative Colorado Springs where the number of marijuana dispensaries now rivals the number of churches. Photo by Joe Mahoney – I-News Network. They viewed Colorado in general and Fort Collins in particular as a real litmus test for the rest of the country as it relates to medical marijuana, said Fort Collins resident Scoot Crandall, who championed the ban. They wanted to show a complete picture of what happens in a community when medical marijuana is being debated. In Colorado Springs, libertarians squared off against religious conservatives in drafting medical marijuana regulations in 2010. Much to the dismay of medical marijuana opponents, the libertarians won. Colorado Springs residents still want government out of their hair. They believe in individual liberties and choices, everything from gun rights to medical marijuana, said Sean Paige, a former city councilman who oversaw regulations that allow dispensaries as close as 400 feet from schools, and day care and drug rehab centers. State law suggests a 1,000-foot buffer around schools but allows local authorities to deviate. Superintendents of three school districts Colorado Springs, Cheyenne Mountain and Academy urged adoption of the bigger buffer zone but were unsuccessful. Yes, there was a lot of fear and a lot of parental anxiety, but the sky hasnt fallen, Paige said. It hasnt led to Sodom and Gomorrah in Colorado Springs. It hasnt been the destruction of our city and our culture. People drive by the dispensaries just like the 7-Elevens and the Walgreens without even noticing them. Religious conservatives say they are watching the marijuana experiment play out and waiting for an opportunity to intervene. Focus on the Family, the giant among Colorado Springs evangelical groups, opposed the legalization of medical marijuana in 2000 and plans to fight any ballot measure this year to allow recreational use of the drug. For now, Focus leaders have had little choice but to tolerate the dispensaries in their backyard. Like many, we are unhappy with the current marijuana dispensary situation in Colorado Springs. However, we are not aware that there are any current options to fight these dispensaries as they are here legally and to date, efforts to limit them have been unsuccessful, said Carrie Gordon Earll of CitizenLink, Focus advocacy arm. If an opportunity to reverse the law or close down dispensaries presents itself, well examine it for future involvement. State law allows local governments or local voters to regulate or ban marijuana-related business. A listing from the Colorado Municipal League shows, as of November, 37 of 85 community bans have been approved by voters while the other 48 were enacted by local governments such as city councils. A proposal to ban dispensaries in Colorado Springs has never made it to the city ballot. In Fort Collins, a citizens initiative split the city for much of 2011. Dubbed Fort Fun by college kids and known for its forestry students and earth-friendly microbreweries, Fort Collins came late to the idea of a ban. A ‘For Lease” sign at Organic Alternatives, one of 23 medical marijuana dispensaries forced to close in Fort Collins this week after citizens voted in favor of a ban. Activists say they watched one nearby community after another prohibit dispensaries. The home of Colorado State University seemed destined to become the regions marijuana mecca. The dispensaries sprang up like crazy, said Crandall, who is executive director of Team Fort Collins, a substance abuse prevention coalition. At one point, they outnumbered our pharmacies. I believe they even outnumbered our Starbucks. The city council initially passed restrictions barring dispensaries from locating within 1,000 feet of schools. But like many communities, they planned to allow those who were already there to stay. Nearly all of the 23 existing dispensaries violated the new regulations. That was the straw that broke the camels back, said City Councilman Wade Troxell, who helped lead the campaign for the ban. We allowed 21 medical marijuana dispensaries to be adjacent to our neighborhoods, next to our schools, surrounding the CSU campus, up and down our main avenue. Troxell said he was walking downtown to get a cup of coffee one morning when he stepped on a dispensary vial. Meanwhile, Poudre Valley schools posted increasing numbers of drug violations. During 2007-08, schools reported 74 drug violations to the state; during 2010-11, that number was 200. Ultimately, the rallying cry behind Initiative 300 became Save our kids! But while 52 percent of Fort Collins residents agreed to the ban, those who pushed it say its uncertain whether theyll see a decline in reported drug use at schools. 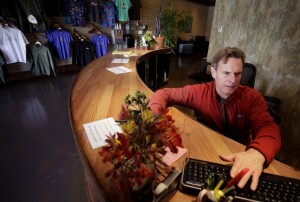 Steve Ackerman of Organic Alternatives in Fort Collins closed his shop on Saturday after citizens enacted a ban. We feel like the damage has been done to our kids, said Crandall. The perception of harm is low. Even though weve been able to secure the passage of this ballot initiative, we have a lot of educating to do with our kids. Ackerman, whos been forced to shut down his dispensary on Fort Collins Mountain Avenue, happens to share concerns about marijuana use or any drug use among teens. He just doesnt agree that prohibition is the answer. Anything we can do to keep kids away from all substances including alcohol and prescription drugs is a good thing, said the father of two. But I think having medical marijuana centers is a better way to keep kids away from it than having no regulation at all. With the dispensaries closing, Fort Collins will give up an estimated $250,000 a year in tax revenue. Troxell says the city will never miss the money. Given the trade-off of social ills they bring, were coming out far ahead, he said. It doesnt take more than a few families not being destroyed to recover the cost of that sales tax. Do medical marijuana dispensary bans result in declining drug violations in Colorado public schools? It may be too early for definitive evidence but the answer for two communities, at least, seems to be no. Virtually all of the 85 communities and local government councils enacting dispensary bans have done so in 2010 or later, and those votes have typically included closure dates coming months afterward. For example, voters in Fort Collins enacted a dispensary ban in November 2011 and set Tuesday as the deadline for closing up shop. Aurora voters passed a ban in November 2010 and, since then, the number of students caught selling marijuana has gone down slightly. But the number found possessing marijuana has gone up. During the 2009-10 school year, before the ban, 50 students were caught selling and 312 were found in possession. The following year, in 2010-11, 39 students were caught selling and 367 possessing. We do not believe that our data is related to the dispensary ban, said Aurora Public Schools spokeswoman Paula Hans. Instead, we believe it is because we have increased the number of APS security officers who are in our schools monitoring these types of behaviors. Perhaps more telling over time will be the experience in Grand Junction, where voters in April 2011 banned dispensaries. An Aurora ban may not have as much impact because nearby communities, such as Denver, continue to allow them. But the Grand Junction vote means theres only one legal dispensary left today in all of Mesa County and thats in Palisade, 12 miles away. Mesa County schools have seen a steady increase in drug violations over the past four years, from 100 in 2007-08 to 155 in 2010-11. But district officials arent sure the brief influx of dispensaries accounts for that. Nor do they think the closure of the dispensaries will turn things around. Frankly, when you look historically at any kind of discipline record, it tends to be an up-and-down wave, said district spokesman Jeff Kirtland. There are years when there are high numbers of incidents, and years when there are low numbers. We continue to see that trend, up and down, consistently. He thinks other factors population growth and the boom-and-bust economy in Grand Junction could be just as important as the presence of medical marijuana dispensaries in shaping those numbers. Critics of the Fort Collins ban say marijuana has always been easy to get and, if anything, dispensaries undermine the black market. Theres nothing to suggest dispensaries themselves are selling directly to minors or to anyone without a medical marijuana card. But police say more marijuana is making its way into the community. Theres a lot of seepage in the system. Theres just a lot of pot being grown, and its very difficult to track where its all going, said Capt. Jerry Schiager, former commander of the narcotics unit of the Fort Collins Police Department. The whole medical marijuana system has increased access to marijuana. Patrons of dispensaries are limited to purchasing no more than 2 ounces of marijuana at a time from a single outlet, because state law says thats the maximum amount a medical marijuana patient should have at any one time. But there is no system of tracking purchases from one dispensary to the next, and medical marijuana patients can buy products from any dispensary at any time. Its possible, for an individual who wanted to, to obtain 2 ounces at 23 dispensaries in a single day, said Bob Powell, a retired Fort Collins businessman who worked on Initiative 300. They can get a lot of marijuana that way, which can get into the hands of our kids. But is that happening? Law enforcement officials have a difficult time connecting the dots. Unlike many other drugs or other prescription medications marijuana is an agricultural product, not something cooked up in a laboratory with definitive markers. Its difficult to determine where a given ounce of marijuana came from or to track where its going. In Colorado Springs, school officials say at least some medical marijuana is flowing into the hands of teens. Schools in District 11, the core-city district, have posted some of the highest increases statewide in drug violations. Palmer High School reported two drug incidents in 2007-08, one in 2008-09, 75 in 2009-10 and 45 in 2010-11. Greg Ecks, director of the districts Office of Student Discipline Services, sees every student found with drugs. He said almost all have been caught with marijuana. The newest trend hes noticing is edibles like marijuana-infused gums. He also sees plenty of little brown dispensary jars. It has a dispensary label on it. That would lead us to the conclusion that its coming from dispensaries, Ecks said. Its passing hands. The students say they dont know where it came from. But the jars are quite common. Its serious and its a growing problem. Even before it was legally allowed for medicinal purposes, it was growing in popularity, he added. Now its filtering down into the middle schools. At Palmer, located in downtown Colorado Springs, students flood into nearby Acacia Park during lunch and other breaks. Its a small, gritty park where homeless people hang out and kids say its easy to score street weed. But their preferred method is to buy wholesale, not from dealers in the park. The favored way for kids to get it pretty much is to go through a grower because that way you can keep up with the growers plants, said a 17-year-old Palmer High School junior. Youd be able to see the quality of it, how its made and be able to trust that person to get you the highest quality you can get. Fourth Judicial District Attorney Dan May remains convinced medical marijuana businesses near schools are leading to increased use among young people. He said that medical marijuana is the No. 1 drug that juveniles in his crime diversion program, which covers El Paso and Teller counties, report using. In 2010, Colorado Springs was so broke that national media outlets such as ABC and CNN covered city leaders selling police helicopters online and urging residents to mow municipal parks, among other measures. May believes city officials have failed to protect young people while scooping up more than $770,000 in revenues during 2011 from medical marijuana businesses. They built their establishments in residential areas, next to schools. Theyre next to churches. Theyre next door to each other, he said. Our city council failed this community.